If you've got little helpers in your kitchen who love baking or if you simply have a sweet tooth to satisfy, the Cookies and Milk app brings the joys of (pretend) baking to your Android device. From sugar-loving toddlers to calorie-conscious adults, baking and indulging in a cyber-cookie just may be the sweet escape you crave. . Expand your children's cookie palate by scrolling through your baking options first and settling on a choice. If you choose to bake cookies from scratch you'll even be provided with the recipe. Choose from more than 10 delicious recipes. Ingredients appear above the mixing bowl. Drag and drop each ingredient into the bowl and mix it up with the touch of a finger. Watch the ingredients transform into delicious dough. Next, drag each dough ball onto the baking sheet until it's full and put it into the oven. When the light comes on, the cookies are ready to decorate. The responsive touch-and-drag interface makes it easy for young children to choose ingredients and toppings with ease. Every kid knows the best part of baking cookies--eating them! Tap the cookie to take a bite, tap it twice, three times, four--uh oh, until cookie is no more. Something to wash it down? 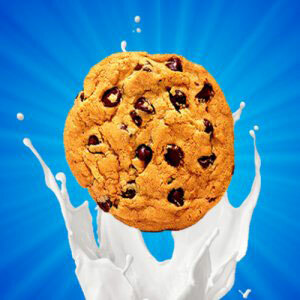 Cookie consumption is never complete without a tall glass of nice, cold milk. Slurp it down and properly complete the cookie ritual with a strong, satisfying, "Ahhhhhh."